Terminal V: The name alone sounds like a space station or a launch pad for jetting off into orbit. And the visionary design of the Dworzak-Grabher architectural workshop is certainly just as captivating, featuring a distinctive look that bears more than a passing resemblance to a spaceship. But that is only the outside. Step inside and you will soon see that the flowing, merging and almost pliable spaces of the interior are equally intriguing. 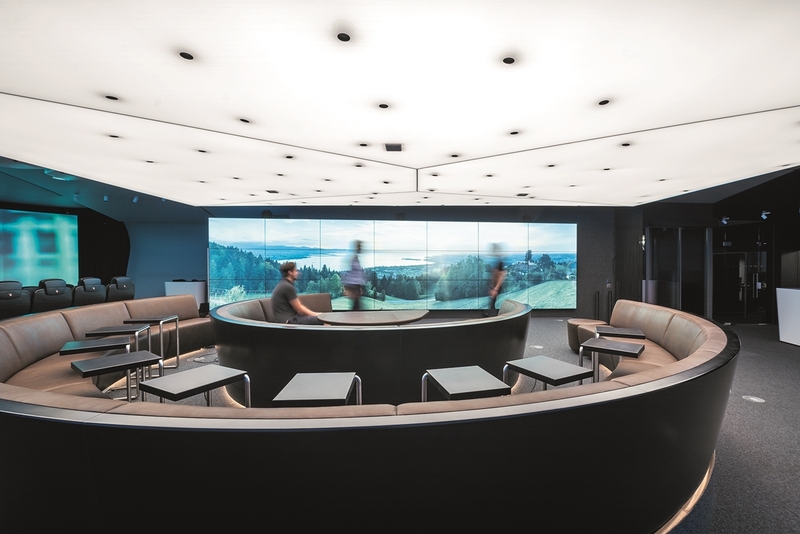 Terminal V – with a ‘V’ that stands for both “virtual" and “Vorarlberg”, the name of the local county – is the virtual reality (VR) showroom of Hefel Wohnbau, a leading general contractor for residential buildings. Anyone coming here to embark on a virtual expedition will get to experience their own personal world: their new home. Visitors are joined on their cyber travels by a customised 60-square-metre version of TEELA. Taken from “the editions” special collection, this futuristic luminaire has been specially developed by Zumtobel for the virtual flights to these dream homes. This family-run property firm has been putting its faith in pioneering visualisation techniques since 2002. Customers can use the very latest VR technology to wander around their future home before a brick has even been laid. To mark the 70th anniversary of the company, Terminal V has this year taken Hefel to a whole new level when it comes to presentation innovation. In fact, the 4D visualisation platform makes Terminal V one of the most modern facilities of its kind in Europe. And Zumtobel is also on board – in more ways than one. The Austrian lighting specialist has used a tailor-made version of the special TEELA luminaire to conjure up impressive lighting moods that suit the unique look and feel of this unique presentation space. The sensory luminaire, which was developed by the renowned architectural firm Delugan Meissl in partnership with Zumtobel, is part of a new special collection: the editions. The atmospheric landscape of light that surrounds this fitting gives rooms an exceptional aura. An extraordinary ambience. Just like in Terminal V. This is where the “Atelier of Light” project team from Zumtobel worked with the client and the dworzak grabher architecture workshop to craft a customised solution that combines all the multifunctional benefits of TEELA in a large illuminated ceiling. The result is a completely new dimension: this six-metre by ten-metre version of TEELA brings acoustic aspects and lighting elements together in one single entity. The tailor-made TEELA stretches over the rows of seats in the VR space of the textile-like landscape at Terminal V like some kind of heavenly body. As an interpretation of the infinite transformability of light, this installation accentuates the dynamic lines of the interior design. The large-area luminaire gives a feeling of added space and looks almost immaterial – almost as if it was nothing more than light. Pure light, you could say. This effect is achieved using the visible textile layer of TEELA, which makes a difference when it comes to both acoustics and uniform illumination. Right to the very edges. The homogeneously lit surface is also equipped with pivoting spots, as designed by Delugan Meissl. RGBW LED light-lines deliver an indirect output that gives the luminaire a striking levity – despite the fact that it covers 60 square metres. Various different lighting scenarios are selected with the help of an external control, while the downlights, uplights and area lighting of the TEELA can be varied according to the specific requirements and constantly adjusted in terms of colour temperature and brightness. Light thereby actively supports the drama and excitement of the virtual journey into the future. And all within the four walls of the Terminal V building.